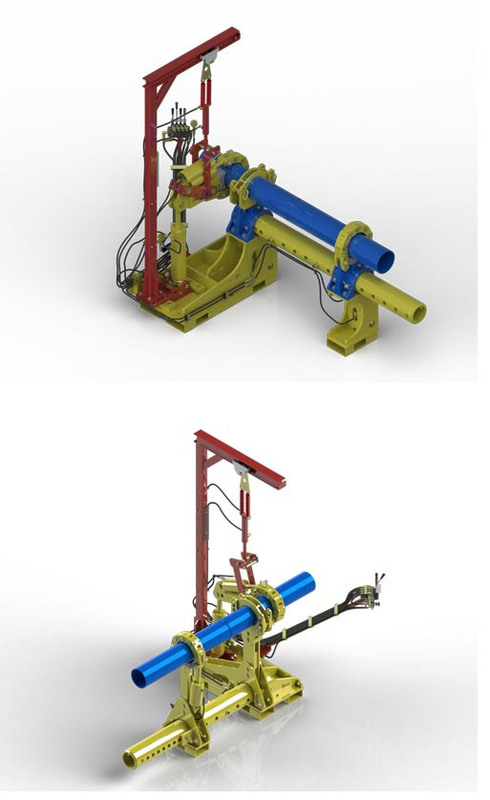 When DTH hammers and other tools are downhole for long periods of time and/or encounter a lot of movement and pressure, the tool joints can become stuck and difficult to break apart. Some operations use manual procedures to break the tools out, at a risk to safety, as well as integrity of the tools. A safer, more convenient solution is to use a DTH breakout bench. Scorpion Oil Tools manufactures a line of benches called "Service Centers" that can be used on a wide array of tools, including DTH Hammers. The special chain design enables the handling of very small tools up to very large tools (2-3/8 inches to 36 inches) with torque up to 250,000 ft-lbs. With Scorpion breakout benches, DTH hammer breakouts are easy to perform, are safer than manual breakouts, and can also be more cost-effective. In addition to DTH tool breakouts, the Scorpion units can be used to makeup (or torque up) DTH tools to specific torque settings, helping to minimize the chances of a stuck joint and damage to the down-the-hole tool. Scorpion benches do not require any special set up or part changing to switch between makeup and breakout operations. Scorpion's breakout benches come in many different sizes and capacities and typically come with a portable motor/power pack (diesel, electric, air, or gasoline) and can be transported between job sites or set up in a shop. Contact Scorpion today for information about available DTH benches.